"It's comforting knowing we'll be taking care of each other." Nine labor and delivery nurses are pregnant at Maine Medical Center. PORTLAND, Maine — Some may wonder, what's in the water at Maine Medical Center? Specifically, in the hospital's Labor and Delivery Unit. Even the nurses who work there are asking that question. “I feel like every other day we would come into work and it would be like, ‘someone else is pregnant,’” said Amanda Spear, a registered nurse. Amanda Spear and eight of her coworkers are pregnant. All are due between April and July. It was more exciting each time seeing who else was pregnant,” said Samantha Giglio, a registered nurse. For many of the women, they are expecting for the first time. For Samantha Giglio, she's pregnant with her second child. "It's comforting knowing we'll be taking care of each other," she said. There is a plan in place at the hospital to cover for all the women when they take their maternity leaves. There are 80 registered nurses currently working in the labor and delivery unit, according to the hospital. 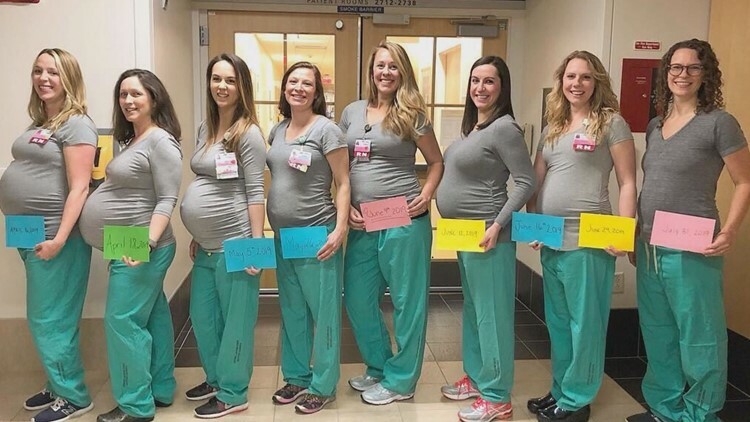 "All of a sudden it was at 50 likes, and we went to bed because we work the night shift," said Brittney Verville, who posted the picture of eight of the nine pregnant nurses, including herself, on Facebook. "When we woke up we're like, 'oh my gosh I think we're viral.'" Her post quickly took off, getting thousands of likes and nearly 2,000 shares. One thing to note, one nurse was absent from the photos. The woman holding two due dates is not expecting twins, she is holding the due date card for the absent nurse. Considering they all work different shifts, it's pretty impressive they were able to pull off the photo!